Last week I published my updated skincare routine and I talked about my Vanity Planet Ultimate Skin Spa System. I got this about 3 months ago with a huge youtuber discount code and I have to say, at first I was a little skeptical. A few of my friends have a Clarisonic and I just never felt the need to get one. My skin never really has problems, and it's too sensitive to exfoliate everyday, so I didn't think a skincare brush would be for me. HOWEVER, I am now in love with my Ultimate Skin Spa. I use it about 2-3 times a week and I notice a big difference in my skin when I do. It's just smoother and brighter and it feels so deeply clean without being dry, tight, or irritated. The brush has 2 speed settings and the set comes with 3 brushes - one for daily use (gray), one to exfoliate (black), and one for sensitive skin (white silicone). I use the gray most often, but I use the black one when I feel like my skin is dull and needs a boost, and I use the sensitive skin one when my skin is sunburnt, broken out, or just sensitive in general. I LOVE that I can choose a different brush depending on how my skin feels that day. 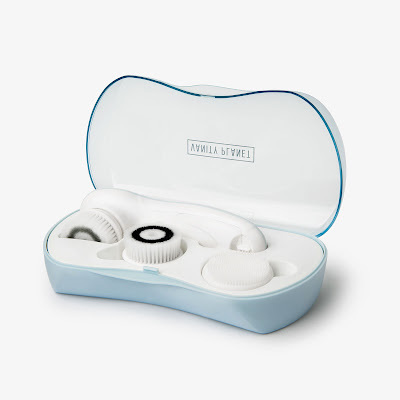 I can't compare to the Clarisonic system because I've never used one, but just by touching them, I think these are softer, not to mention more cost effective! For comparison, the most similar Clarisonic brush is the Mia 2, which comes with just one brush head, is $169. After that, each brush head is $27! The Ultimate Skin Spa System is $125, but they do TONS of coupon codes! Here's a close up on the brush so you can really see what's going on! There are so many bristles and they're SO soft. Overall, I'd highly recommend the Ultimate Skin Spa System. I've truly been converted and I love how clean yet soft my skin feels after I use it. The travel case makes it easy to take with me on all my trips and the brushes are easy to clean and cheap to replace. 10/10!